This is the last project we made last Tuesday night. I wanted to show my group the the faux suede technique which I absolutely LOVE using for masculine cards. As I've said before, you really can't be using too much ribbon or bling on a guy card or it really doesn't end up being a guy card (I know my DH doesn't go around sporting ribbon or jewels). Faux suede elements on a card will give some texture and interest without accessories. The Crumb Cake strip is faux sueded (is sueded even a word? Spell check doesn't think so!) and also paper pierced. To do the faux suede all you do run the cardstock over a bone folder back & forth, front and back just like you were curling ribbon with scissors. Keep going at it until the fibers begin to break down and your cardstock starts to peel apart. You might have to help pull the 2 pieces apart or continue to use the bone folder on a stubborn area. I found that the Crumb Cake took longer than the regular colored cardstocks so don't give up too soon. At the end you'll have a nice soft to the touch piece of cardstock....Super Cool! The Certainly Celery piece is also roughed up using the bone folder. Just rub the edge of your bone folder along the edge of the cardstock. Again, you'll see the layers of paper pulling apart but instead of continuing to do the whole piece you just stick with the edges and do as much or as little as you want depending on the look you're going for. The palm tree was inked up using the Certainly Celery and NEW! Crumb Cake (formerly Kraft) markers. The palm frond on the background is Marina Mist ink on Marina Mist cardstock. Yay!!! My AC was fixed today and so far I haven't injured myself or broken anything else. More time for stamping! Here is the second project we did on Tuesday night. I try to show some different folding techniques at my classes to keep things fresh. I know with my personal stamping I usually just make the same A2 size with a fold on the side or top so when I come across one that is this easy I jump all over it. This one is called the Joy Fold and it's basically 2 cards put together to make one. The Daffodil Delight is an 8.5" x 4.25" piece and it is scored at 3 inches and the edge is punched with the Scallop Trim border punch. The black piece is 8.5" x 3" and just folded in half. Remember to round all of your corners with the corner rounder punch BEFORE you adhere the pieces together...it works much better that way (ask me how I know!). My photo shows the card I made that I didn't do all the corners and it looks much better if you round everything! In this side view you can see that the front flap of the black cardstock holds down the front flap of the Daffodil Delight piece. The stamping is pretty easy. I cut a mask out of a sticky note for the birdcage portion. I stamped the birdcage on my Whisper White first, then masked it and then stamped the stand. The stand part is pretty tall on its own so you can make your cages as tall or short as you want them to be. I added the cute little owl to the birdcage using Daffodil Delight ink. I have this set in the clear mount and I find it's super easy to get things lined up when you can see right where you want to stamp. To get it absolutely perfect use the Stamp-a-ma-jig but for eyeballing it, clear mount is great. I'm excited about the new colors in accessories and wanted to show my ladies the 1/8" taffeta ribbon and the new assortments of brads. I'm slowly on my way to collecting the 4 assortments of buttons and brads in each new color collection and since I started with the Brights collection We used the Daffodil Delight ribbon & brad on this card. And here is the card opened. It's also kind of nice to have a smaller space on the inside for writing....you don't have to write so much to fill it up! It's been a HOT & busy week so far at my house...we've had quite a saga the last 2 weeks with our AC units. 2 weeks ago the downstairs unit bit the dust and just this past Sunday the upstairs unit decided it felt left out and wanted some attention so it decided to stop working as well (keep in mind that our house is only 4 years old so that makes all this even more unacceptable!!). We've been waiting on a part since the repair guy came to look at it on Monday morning. We're keeping our fingers crossed that tomorrow will be the big day that it gets fixed. Then, in my heat induced daze from cleaning without AC on the second floor I was carrying the vacuum down the stairs and slipped and fell. My backside took a serious beating but the laptop which was at the bottom of the stairs waiting to be carried up took the biggest beating...the whole screen is smashed and unusable. Wow! Are we racking up points on our Discover card or what?? Oh, and I've been volunteering at our church's VBS this week and had my monthly stamp club meeting last night. How is it only Wednesday night?? To make myself feel better I keep looking at this project that we made last night. So many things about this card just make me happy, the pearls, the Elegant Lines embossing folder, the 2 3/8" scallop circle punch, Early Espresso cardstock & ribbon....Ahhhhh....I've almost forgotten how stinkin' hot it is in my house! For my projects this month I wanted to try to cram as many new things as I could onto each one because I was so excited about everything that I ordered I just couldn't not use it, you know?? I totally LOVE this new embossing folder. It gives such a great deep impression you just want to keep touching it! The new pearl jewels are just right for highlighting the embossed design. For the stamping I paired Define Your Life and Defining Alphabet (not new sets but still awesome) and just lightly sponged the edge of the Very Vanilla scalloped circle. I got the idea for the ribbon across the edge from some samples in our demonstrator magazine Stampin' Success a month or 2 ago. I've got to go concentrate on cooling off now! Thanks for looking! I hope I still have people out there interested in my stamping after such of long time of not showing any new projects! I was away from home for almost 2 weeks and used up my stash of blog posts and then when I got home it took awhile for the fam to get back into the swing of things. Then my cousin and her kids came for a visit for a few days. Needless to say there was no stamping in my house that week with 4 kids aged 4 and under running around! While my cousin was here my BIG order of new Stampin' Up stuff arrived....she's not a stamper but she had fun looking at all the goodies with me. I'll turn her into a stamper yet. She bought some retired supplies to make tags for her baked goods (she's a pastry chef and makes wonderful treats!) so I can't wait to see what she starts making! So this past weekend I finally got busy playing with my brand spanking new stuff and I'll be posting more regularly. July is a busy month for us (both boys birthdays, our anniversay, & the dog's birthday) so I have to make a lot of thank yous for all the wonderful gifts we've received for the various occasions....well I guess not for the dog's birthday but only because I don't have a dog stamp....add that one to the list! This owl is so cute. He's included in the new stamp set Aviary and I think this set will see a lot of use in the next few months...I hope you don't get tired of it! The stamping is pretty straightforward. The only really jazzy parts (totally thought of jazz hands right there!) is the Early Espresso strip that was run through the Big Shot using the Square Lattice Textured Impression folder. I also did the same for the little punched circle I used in my Build-a-Brad. Each little owl was punched out using the 1" circle punch and of course popped up with a dimensional (yes I'm addicted to dimensionals!). I also apologize for the poor quality of this and some upcoming photos. I think our camera is slowly biting the big one. I can't zoom while on the macro setting anymore...the pictures get totally washed out with crazy vertical lines. If you have a good camera recommendation I'd love to hear it! 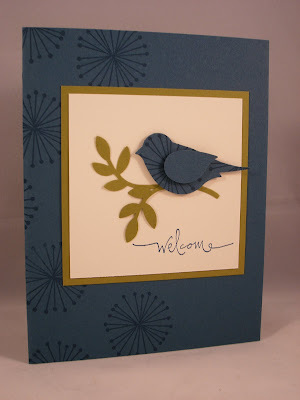 Here is the third and last project we did at my last Stampin' Tuesday class. It is really an easy card that I CASEd from page 17 of the new Stampin' Up catalog. This would be a fabulous project to do at a workshop that doesn't use any embellishments and showcases a great punch. I used a different stamp set from the one shown in the catalog sample since this project was done at my 2009-2010 catalog retirement party I wanted to use the retiring sets Good Friend and Warm Words. First, I stamped the "dandelion" stamp from Good Friends on the Not Quite Navy card base. I also stamped it on a piece of scrap Not Quite Navy and punched out my bird body with the XL 2 Step Bird punch. I mounted the bird wing on the body with a dimensional. Then I punched out 2 branches in Old Olive. All of that was adhered to a square of Very Vanilla and Old Olive. The welcome sentiment is stamped in Not Quite Navy. An easy but eye-catching card! We made this sweet little project at my last Stampin' Tuesday. When I first saw this tea light cupcake on Splitcoaststampers I wasn't quite sure what you might do with it after you made it. Then I thought that if it was paired with a little 3x3 card it would be the perfect little something to give to a co-worker, a neighbor or an elderly relative to recognize their birthday. Just a little something when a gift is too much and a card is not enough. I followed the tutorial on Splitcoast for the cupcake and added 2 of the small butterflies from the Beautiful Wings embosslit (so many ways to use this cute little die!) on the top and a Pretty in Pink taffeta bow on the front. For the 3x3 card, I embossed the front with the Square Lattice embossing folder (Summer Mini) and used the corner rounder to soften the edges. For the cupcake image I used my markers to color the top and bottom and then huffed on it to re-moisten the ink and then stamped on Whisper White cardstock. Color the candle with markers and stamp that on the cupcake. Punch the cupcake out with the circle scallop punch. I recolored just the frosting and then stamped and cut it out. I popped the cut out frosting up on dimensionals. I mounted the scallop circle on a 1 3/4" circle of Soft Suede and then adhered that to my card base. 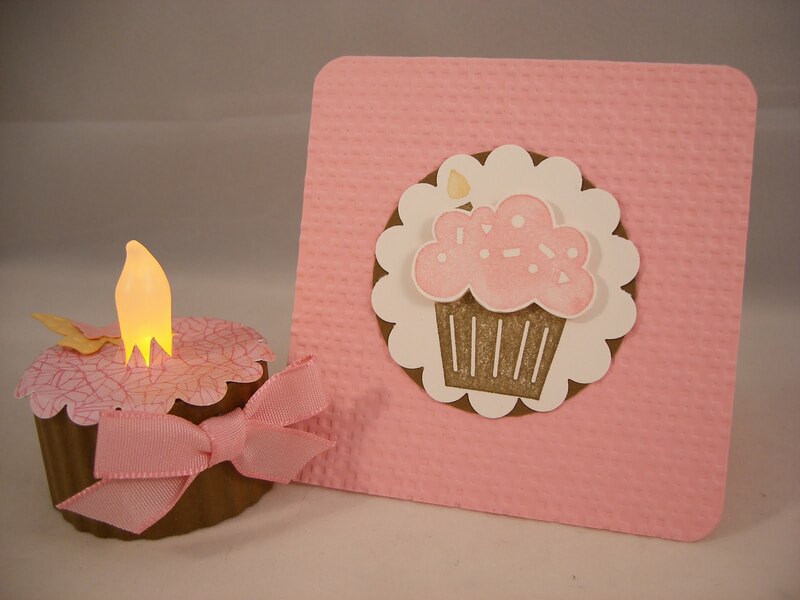 Now you have a sweet little cupcake & card for someone special.